The Australian Seljak Brand proves that a sustainable business model with local materials, which others consider as waste, is not only possible, but it can lead to creating beautiful and valuable products. Seljak Brand applies the circular model in their production process, which sees waste as a resource. The circular economy aims at making the most out of available resources in order to reduce waste and avoid pollution. That means the used material is either biodegradable or of such high quality that is can be reused again. This is contrasting the linear model, which we have so accustomed to. In a linear economy the working principle is to take, make and dispose. In other words the used resources are extracted, products are manufactured and after they are consumed they are dumped. Offcuts from the factory floor of Australia’s oldest weaving mill in Tasmania are used to create the Seljak Brand wool blankets. Wool has the advantage to be odor and stain resistant, as well as being antibacterial, lightweight, breathable and insulating. 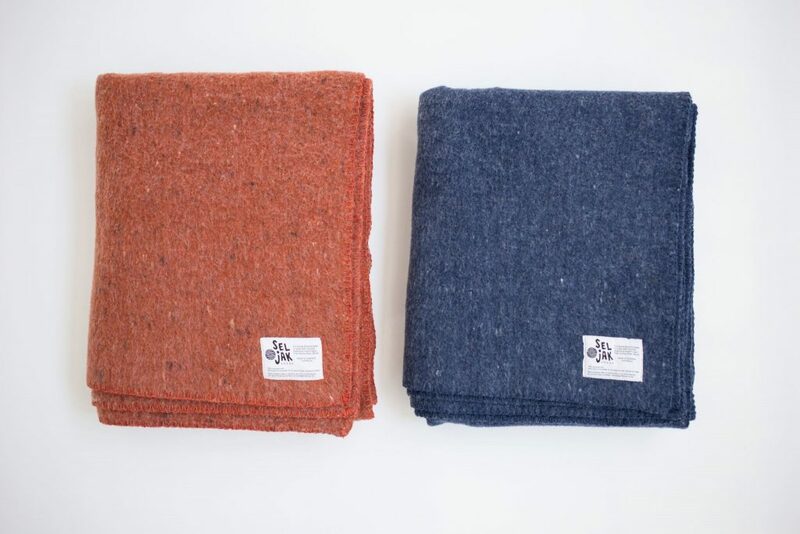 Although wool is a renewable resource in itself, the blankets are made from 70% recycled merino wool and a 30% blend of recycled alpaca, mohair and polyester for strength; resources that are considered as waste from another production line. In order to close the loop of the circular model, Seljak Brand offers the opportunity to take back the blanket for free. They even use a carbon neutral courier service in Australia, called Sendle. Back at the mill the used blanket is shredded and spun into new yarn to make new blankets out of the same material. But as the quality of the product is high it can easily last for a life-time. Thus the option to return a blanket is an end of life solution that probably gets not used much by individuals. Who would want to return the cozy blanket? Nevertheless, this only shows once more the awareness of Seljak Brand. The company takes responsibility for what they are putting on this Earth and is offering a solution to close its product circle, which is actually the start of a new product circle. 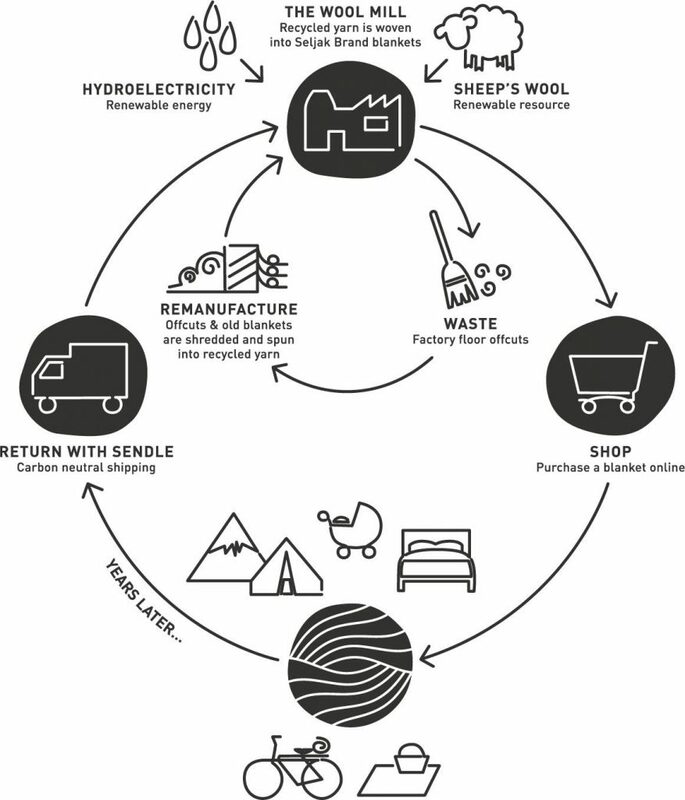 The circular approach of Seljak Brand is emphasizing conscious consumption, where customers become aware of what they are buying, how this affects local suppliers and what effect their actions have on the environment. It is comparable to the slow fashion approach. This sustainability and longevity cannot be compared to low quality consume-and-dispose products, which are often broken after using them only once. The price for the Seljak Brank wool blanket starts at 199 Australian dollars, which is around 150 €. The blanket is made for a lifetime and even beyond that, since the materials can be reused again. Moreover, the resources are not even extracted, since they are recycled waste of another production. Behind the Seljak Brand are two sisters, Karina and Sam, who imagine a world without waste. Their ambitious vision inspired them to put the circular model into practice and has led to the creation of a business that does things differently. For every ten blankets they sell, Seljak Brand donates one to the Asylum Seeker Resource Centre in Victoria. Since their grandparents were refugees from Slovenia, the both want to support asylum seekers making a new home in Australia. On their blog they share examples from the circular economy and to which new zero waste projects their journey might take them. And yes, they deliver to Europe as well! I had the pleasure to be able to talk to Sam while she is expanding her knowledge in sustainability in Sweden. Would you prefer to buy a product that treats the resources of this planet responsibly?